Make a weeknight dinner extra-special without any extra work. 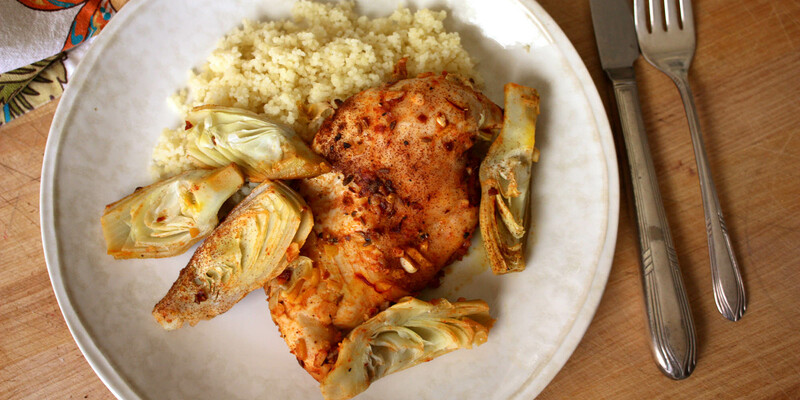 The preparation for this flavor-packed Moroccan Chicken recipe couldn’t be any easier. Some versions of Moroccan Chicken with Preserved Lemons call for sautéing the chicken which requires lots of extra oil and is a less healthy way to go (that’s putting it lightly). We have opted to bake our Moroccan Chicken bathed in a mixture of bold spices which dress the tender chicken to perfection. The recipe calls for Preserved Meyer Lemon. The flavor of the dish really benefits from the bold, lemony taste of preserved lemon. If you don’t have any, you can use a vegetable peeler to remove strips of lemon peel from a whole lemon, being careful to avoid the white pith underneath. 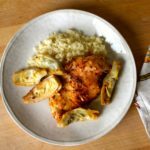 This flavorful Moroccan chicken calls on classic Moroccan spices like saffron, ginger, and cloves to give it a delicious flavor. Combine chicken, Preserved Lemon, oil, garlic, ginger, artichoke hearts, cinnamon, pepper, cumin, paprika, red pepper, cloves, and saffron in a large bowl; mix well. Arrange chicken mixture in a baking dish. Bake for 20 to 25 minutes, or until chicken is no longer pink in the middle. Serve chicken with couscous if desired. To use preserved lemon, wash lemon and remove pulp. Thinly slice or chop rind.